We will be posting information on special offers in the near future. Please check back soon! 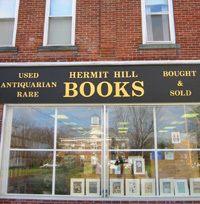 Welcome to Hermit Hill Books! Hello, and thank you for visiting Hermit Hill Books! We are an independent bookstore located in Poultney, Vermont, home of Green Mountain College. We have a large inventory of used, out-of-print, and collectible books. Our specialties include history, poetry, science, nature literature, modern first editions, and Vermontiana. We can also search for that specific book you may be looking for. On this site you will find information on our store (including directions and hours), our special offers, announcements of special sales and events, new arrivals, and more. We can also search for a specific book you may be looking for - get in touch with us and we'll be happy to help you out. Site and contents ©2004-2005 Hermit Hill Books. Site designed by Jesse Brown. Problems with the website? Email webmaster@hermithillbooks.com.